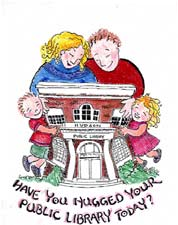 The Friends of the Hudson Public Library is a non-profit organization bringing together people who care about libraries and who believe in what libraries represent. Friends are volunteers who are interested in promoting their library by helping to improve its services, resources, and its role in the Hudson community. The Friends have been very successful in raising funds for the library through their annual fall book sale. Thousands of books are sold each year at extremely affordable prices. The sale is held at the VFW Club on Palmieri Drive in Hudson. The money raised is then spent on items or programs that the library might not otherwise be able to offer. Other fundraising activities include: the annual membership drive, and the used toy sale at Hudson Fest. If you are interested in volunteering for any of these projects, feel free to attend a Friend’s meeting or email the Friends at hudsonmalibraryfriends@gmail.com. Membership forms for joining the Friends are available at the adult circulation desk or you can download a membership form online. Membership benefits include admission to the “early bird” preview for the Friend’s book sale. Please join us in support of the library. The Friends meet on the third Tuesday of the month at 7:00 p.m. in the Children’s Department. Please call in advance to confirm the meeting schedule. Everyone is welcome to attend. The Friends are a friendly, informal, active group which is always looking for new members.